Who Causes You the Most Trouble? A reporter once asked the great evangelist D.L. Moody which people gave him the most trouble. He answered immediately, "I've had more trouble with D.L. Moody than any man alive." God Will NOT Abandon Those Who Want Him More Than Anything Else! For he will hide me in his shelter in the day of trouble; he will conceal me under the cover of his tent; he will set me high on a rock. “Come,” my heart says, “seek his face!” Your face, Lord, do I seek. Do not hide your face from me. Do not turn your servant away in anger, you who have been my help. Do not cast me off, do not forsake me, O God of my salvation! Psalm 127 is the scriptural basis for this fantastic piece by Philip Yancey. It's not an option for Christ's Church to stint on telling the truth about sin and forgiveness, law and gospel. Churches and Christians who, in the name of their own version of "love," fail to use the keys which Christ has conferred on them, risk the immortal souls of both themselves and those who heed their false gospel. What is the "Office of the Keys"? It is that authority which Christ gave to His Church to forgive the sins of those who repent and to declare to those who do not repent that their sins are forgiven. What are the words of Christ? Don't Be Afraid of the Word, "Righteous"
James writes in the New Testament, "The prayer of the righteous is powerful and effective" (James 5:16). And don't be frightened by that word "righteous." You don't have to be a stained glass saint to be righteous. A righteous person is simply a sinner who is right with God: they repent for their sins and trust in Jesus as their Lord. You can be assured that your prayers in Jesus' Name do great things! Near the end of the season comes Passion Sunday (also known as Palm Sunday). On this day, we're called to remember both Jesus' seemingly triumphal entry into Jerusalem on the Sunday before His execution and Christ's passion, as well as its foreshadowing of Easter. Passion, a word that is used in entirely different ways today, really means to be so committed to the well-being of another that we're willing to die for them. Christ had that kind of commitment to us and so, went to a cross. Passion Sunday begins that portion of Lent called Holy Week. "I aint got no horror story..."
Here's a "video" from his recording. Here's a live version. It's great that he asked some audience members come up on stage. What I love about this track is that it's simply this guy's testimony about his own relationship with Christ. So often, Christians who have always believed and never been doubters, addicts, thieves, or serial adulterers feel inferior because they don't have a dramatic story to tell about their conversion. These are people like Fred Meuser, who was the son of a pastor and served as president of the seminary from which I graduated. If you spent any time with Fred, you would see as all of us who were students at Trinity, that he believed fervently in Jesus. Jesus was the center of his life. And yet, Fred had experienced no drama in his life, no years of hollow rebellion, no dark nights of doubt. "I can't remember a time when I didn't believe in Jesus," he told a group of us who had just begun our seminary training in back in January, 1980. It's OK for Christians to have always believed. In fact, it's more than OK. Ask any Christian who, before coming to faith in Christ, wandered far from God, and they'll tell you that they would gladly have skipped all that "drama" if in its place they could have known and followed Jesus sooner. Who need earthbound "drama" when you can have the King of kings as your best friend? Five years ago, a remarkable young member of the congregation I serve as pastor, Sarah, underwent the first of two bone marrow transplants (BMTs). A second one happened two months after I became her pastor, in January, 2008. Both procedures involved long hospital stays and accompanying complications. Through it all, Sarah and her wonderful family--Mom Becky, Dad Bryan, and Brother Stephen--have displayed faith and tenacity. They are heroes of Christian faithfulness to me! Last week, Sarah contracted pneumonia and struggled to breathe. Years of chemotherapy have significantly weakened her immune system. The quickness with which the pneumonia struck, at a point when everything was going so well for her, was stunning for everybody, especially for Sarah and her family. They all had to hit "battle stations" again. For Bryan and Stephen, that entails not just visits to the hospital and lots of praying, but also exhausting errand-running and schedule-juggling, among other things. For Sarah's mother, Becky, a professional person just like Bryan, this means remaining with Sarah 24/7, acting as her advocate, prayer partner, intermediary, and "pal." It's a role that Becky plays well and includes a healthy respect for the fact that Sarah is now a young woman of 19. Thank God, Sarah is doing well! Last night, she didn't require oxygen. She isn't on oxygen today. The regimen of treatments, buttressed by the prayers and love of Bryan, Becky, and Stephen, along with the pleading of an army of prayer warriors, has been used by God to turn away this latest assault on an incredible young woman. Sarah is to go to a regular care unit today and may be discharged tomorrow, in time to spend a very happy Thanksgiving with her parents, brother, and extended family! During a phone conversation a little while ago, Becky revealed to me for the first time, that she has a new favorite Bible verse. Throughout Sarah's previous hospitalizations, Becky grasped hold of Psalm 46:10, which says, "Be still, and know that I am God!" That's a great passage, part of the psalm that inspired the lyrics of Martin Luther's hymn, A Mighty Fortress is Our God. It's been a touchstone passage for her for several years. God makes hundreds of promises in His Word, the Bible. Someone has said that all of those promises are like blank checks, just setting there for believers to "cash in." The God Who has never broken a promise is ready and willing to answer His promises to us. Of course, maturing believers realize that God takes an eternal perspective on things. This is why Paul says, in 1 Corinthians 15:19, "If for this life only we have hoped in Christ, we are of all people most to be pitied." We often want the things we pray for to happen immediately; God knows that He has an eternity to provide for us "far more than all we can ask or imagine" (Ephesians 3:20). But we know that God's promises--God's Word--are absolutely sure and completely reliable! In Becky's new favorite passage from Isaiah, we see a promise from God for all believers who are exhausted and who know that the burdens on our shoulders are too huge for us to carry. God will take our burdens and carry them for us, just like Jesus, God incarnate, already took the weight of our sins to the cross. He wants to bear the burdens you and I were never meant to carry. Peter talks about this in the New Testament: "Humble yourselves therefore under the mighty hand of God, so that he may exalt you in due time. 7Cast all your anxiety on him, because he cares for you" (1 Peter 5:6-7). If you let Him, God will carry you! Will You Stand Up or Just Watch? And the people stood beholding. And also the rulers scoffed, saying, "Others he saved; let him save himself, if this man is the Christ, the Chosen One of God." The verse comes as part of Luke's account of Jesus' crucifixion. It describes two groups: the people (in Greek, the laos, from which we get the English word laity) and the rulers (in Greek, the archontes, or the first ones), which can be translated as leaders. "The rulers" in this passage is not a reference to the civil rulers, the foreign Roman conquerors, but to the religious leaders. They were the Temple leaders of God's chosen people, the Jews. The "actions" of each group interest me. The people stand and watch as a man who has committed no crime is subjected to execution at the hands of the Gentile Romans. The people may have been horrified by what they saw, but they did nothing. I think it's safe to say that they actually relish their lack of religious power or influence. These things enable them to hide behind a feigned ignorance about Jesus. Their ignorance must be fake because even one of the hardened criminals being executed next to Jesus can see that Jesus is the King. He understands that Jesus will somehow live on beyond death, confesses his sins to Jesus, and professing faith in Jesus as the King of kings, asks to be remembered in Jesus' kingdom. The people simply could not have been ignorant about Who Jesus is. But the people know that if they confess their sins and profess faith in Christ, crosses might await them, too. They'd rather save their necks and forgo being part of Jesus' eternal kingdom than be with Jesus in paradise. Taking a stand is too risky for them, too inconvenient. The other group in the verse is the leaders. One thing especially interests me about their words. There is an intrinsic confession of faith in Jesus' power: "Others he saved." They acknowledge the reports about Jesus to be true. They knew that Jesus had saved some from death (like Jairus' daughter and his friend, Lazarus), saved others from demon possession, saved some from blindness, saved some from execution, saved others from disease, saved still others from social shunning. In other words, they acknowledged all of the saving deeds that pointed to Jesus as the long anticipated Christ (Messiah or Anointed One or King), but refused to bow down to Him. The leaders knew Who Jesus was, but instead of welcoming Him or trusting the witness about Him in God's Word--what we Christians know as the Old Testament portion of our Bibles, they wanted Jesus dead. They loved their own power and position more than they loved God. In fact, they had replaced God's Word with their own teaching. When God showed up in the flesh, He threatened them. In the days of the Reformation, Martin Luther pointed out that the leaders of the sixteenth century Church had arrogated powers to themselves that didn't belong to them. Through an elaborate legalistic system, they stood between the God revealed in Christ and the laity. They tried to keep the people from reading the Bible. They changed the liturgy, usually spoken in a language only elites could understand, from a means of praising and interacting with God, to an object of terror, grim obligation, superstition, and extortion. This, of course, is a liberating notion. Historians like Rodney Stark and Alvin J. Schmidt have shown that this teaching that all believers are equal in the sight of God, each with their own ministries, played a central role in the development of the Enlightenment, the idea of the individual, the modern democracy, and market capitalism. But the priesthood of all believers also carries with it responsibility. Christian laypeople who know Jesus as Messiah and King can no longer dodge either His Lordship over their lives or their responsibilities as priests. Peter says that the priesthood of all believers has a purpose; God makes us priests "in order that you may proclaim the mighty acts of Him Who called you out of darkness into His marvelous light" (1 Peter 2:9). In Lutheran circles, this means that while pastors have certain functions--our confessions speak of the pastor's ministry of "Word and Sacrament," it doesn't alter the fact that all Christians are privileged to have their own relationship with Jesus Christ. It doesn't alter the fact that they are called to know the Word of God for themselves. It doesn't alter the fact they're called to grow and mature in their faith and that they have their own ministries. Today, many of the elites in my own Evangelical Lutheran Church in America (ELCA), in the name of what Dietrich Bonhoeffer would call, "cheap grace," are telling us that people don't need Christ for salvation, that repentance is unnecessary, that the Word of God is only one source of authority in the lives of Christians and the Church (rather than the authoritative source and norm of our life, faith, and practice), and that if you accept the Bible's teachings that sexual intimacy is to be confined to heterosexual marriage, you're guilty of sin. The question before laypeople in the ELCA is simple: Will you accept these false teachings and ignore your duties as priests of God, or will you lay claim to your God-given role and trust in Christ alone? Will you seek to reform our denominational body? Today, in modern North America, no Christian leader can order your crucifixion. So, the only things impeding any ELCA layperson from praying and working to bring our denomination back under the Lordship of Jesus Christ are indifference, laziness, or complicity with false teaching. ELCA Lutherans: Our denomination is in error. Will you stand up for Jesus or will you just watch? If you're intent on doing more than watching, why not take the following initial steps? Sometimes what we see is the thing we’re looking for. We see it because we’re open to seeing it. On this Christ the King Sunday, the last Sunday of the Church Year, our Gospel lesson seems, at first, to be out of place. After all, we’re about to celebrate Thanksgiving and are looking ahead to Christmas. 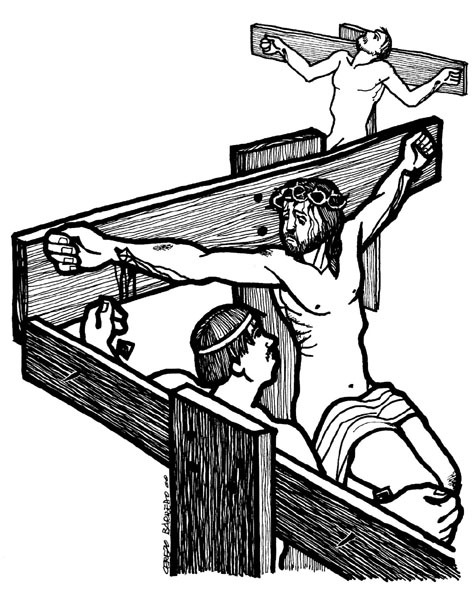 But the Gospel lesson is the story of Jesus’ crucifixion, an account of the first Good Friday. But the lesson seems out of place in another way: Nobody seems less like a king than a man executed on a cross. Not many will look at the crucified Jesus and see a king, let alone the King of kings. True story: A young woman rediscovered her faith in Jesus while she was a teenager. She bought a simple cross necklace. One morning, her father spotted her wearing the necklace and asked what was going on. She explained that she wanted to be able to see the cross in the mirror every time she washed her hands or combed her hair. It would remind her of Christ. Her father was repulsed. “Do you have any idea what happened on the cross?” he asked her. He went on to explain in detail what a humiliating and life-crushing experience crucifixion was. To that man, Jesus’ death on a cross was proof that Jesus was no king, just another pathetic victim of the world. To him, the story of Jesus on the cross ended not in the Savior paying the price for our sins nor in His resurrection from the dead so that all who repudiate their sin and believe in Jesus will live with God forever. To him, Jesus’ story ended in death for Jesus and for us all. Intent on making his own way in the world, what that man wanted to see when he thought of Jesus on the cross was exactly what he saw. In our lesson today, the jealous religious leaders who sought Jesus’ death, the cynical soldiers who gambled for His clothes, and one of the criminals crucified with Him all saw Jesus as they wanted to see Him. Each in their way, taunted Jesus, seeing Him as a loser headed for utter humilation and defeat. Whether the leaders, the soldiers, or the first criminal harbored notions that Jesus really was the Messiah, God’s anointed King, may not be important. It's clear though, that the religious leaders knew that Jesus was the King, but wanted to get rid of anyone who might threaten their status. The others who taunted Jesus that day were probably just garden-variety cynics who believed, like the father of that young woman, that life must end at the grave. Even the crowds who gazed on these events in silence appear to see only hopelessness in Jesus’ crucifixion. I suppose most people who take the time to consider Jesus on the cross see hopelessness. They can’t see how Jesus’ crucifixion proves that He is the King of kings. Only one person in today’s Gospel lesson was foolish enough to see the power of God in Christ’s crucifixion. He was one of the criminals. He looked at the suffering Jesus on the cross and saw not a defeated man, but the King of kings. He was so certain of Jesus being the King that he turned to Jesus and said, “Jesus, remember me when you come into your kingdom.” Jesus promised, not because the criminal deserved it, but because he both confessed his sins and professed his faith in Jesus, that he would on that very day be with Him in paradise. As good Lutherans who read our Bibles, we all know that it wasn’t because he was smarter than the others, or that he was a better person, or that he had done more good things. None of these things create faith or give us our places in Christ’s kingdom. Faith that saves us from sin and death is a gift from God. In another place in the New Testament, Paul says, “No one can confess ‘Jesus is Lord,’ unless he is guided by the Holy Spirit” (1 Corinthians 12:3, TEV). God creates and sustains faith in those who are open to seeing Jesus as their Savior and their King. Today’s Gospel lesson shows us that only one kind of person is open to seeing Christ as King. Only one kind of person will pay attention when God’s Spirit prompts them to confess their sins or follow Jesus Christ. Michelle Akers was the first American woman to play professional soccer in Europe. After scoring ten goals in five games in the first-ever Women’s Cup in 1991, she signed an endorsement deal that brought her fame and money. She got a tryout to be a place kicker with the Dallas Cowboys, her longest attempt going 52-yards. Strength and hard work, the two kings on whom Akers had relied her entire life, could no longer be called on to help her. She says that it was unbearable to not be the “best in the world” or the person who could always bounce back from any injury. “I was forced to spend a lot of time thinking about who I was. I didn’t like what I saw,” she says. Then, her husband left her. Who sees Jesus Christ as King? People who see that their lives are broken without Him. They're also people who see that at the end of our power to cope or hope is a King Who fills His people with love and gives them the capacity to face any cross in the certainty that they belong to God forever! Years ago, at a national gathering of Lutheran youth in San Antonio, I met a nurse who worked in a nursing home. She told about caring for a retired pastor who was dying and had, for some time, been in a coma. She knew his favorite song and so, standing by his bed one day, sang it to him: “Yes, Jesus loves me; Yes, Jesus loves me; Yes, Jesus loves me, the Bible tells me so.” At that the pastor lifted himself from the bed as far as his weak arms would allow and looked the nurse straight in the eye to tell her, “Don’t you ever forget it!” Then, he fell back on his pillow and died.